林友结, 蔡倩莹, 徐云云, 刘海燕, 韩文晖, 汪艳, 檀燕, 熊海燕, 胡安群, 郑英杰. Lin Youjie, Cai Qianying, Xu Yunyun, Liu Haiyan, Han Wenhui, Wang Yan, Tan Yan, Xiong Haiyan, Hu Anqun, Zheng Yingjie. Lin Youjie, Cai Qianying, Xu Yunyun, Liu Haiyan, Han Wenhui, Wang Yan, Tan Yan, Xiong Haiyan, Hu Anqun, Zheng Yingjie. Association and interaction of pre-pregnant body mass index and gestational weight gain of women on neonatal birthweight[J]. 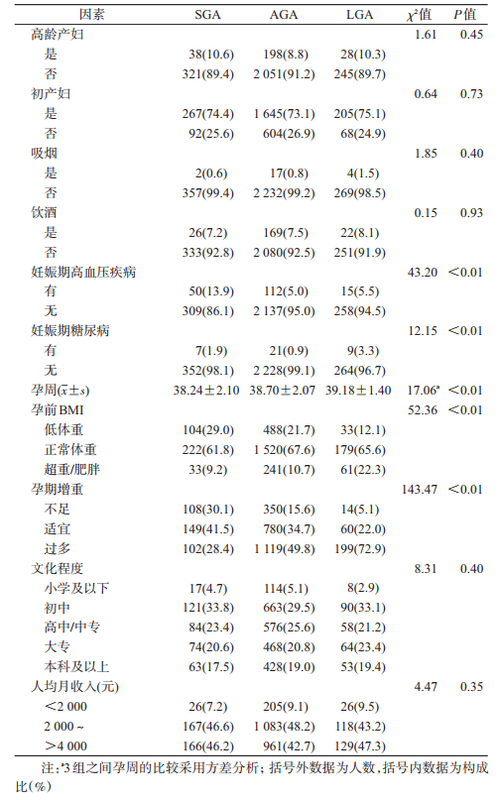 Chinese Journal of Epidemiology, 2018, 39(6): 770-775. Abstract: Objective To investigate the association between maternal pre-pregnant body mass index and gestational weight gain, as well as their interaction on neonatal birthweight. Methods We built a cohort in Anqing Municipal Hospital from January 2014 to March 2015, enrolling pregnant women who decided to give birth in this hospital. All women were asked to fill a questionnaire for basic information collection. Medical information of both pregnant women and their newborns were obtained through electronic medical record. Chi-square analysis, multinomial logistic regression, multiplicative and additive interaction methods were used to analyze the association between pre-pregnant body mass index and gestational weight gain as well as their interactions on birth weight of the neonates. Results A total of 2 881 pregnant women were included in this study. Of the 2 881 newborns, 359 (12.46%) were small for gestational age (SGA) and 273 (9.48%) were large for gestational age (LGA). After adjusting the possible confounding factors, results from the multinomial logistic regression showed that pre-pregnancy underweight women were more possible to deliver SGA (aRR=1.33, 95% CI:1.02-1.73). If the gestational weight gain was below the recommended criteria, the risk of SGA (aRR=1.64, 95% CI:1.23-2.19) might increase. Pre-pregnancy overweight/obese could increase the risk of being LGA (aRR=1.86, 95% CI:1.33-2.60). Maternal gestational weight gain above the recommendation level was associated with higher rates of LGA (aRR=2.03, 95% CI:1.49-2.78). Results from the interaction analysis showed that there appeared no significant interaction between pre-pregnancy BMI and gestational weight on birthweight. Conclusion Pre-pregnancy body mass index and gestational weight gain were independently associated with neonatal birthweight while pre-pregnancy BMI and gestational weight gain did not present interaction on birthweight. Wardlaw T, Blanc A, Zupan J, et al.Low birthweight:country, regional and global estimates[M]. New York: UNICEF, WHO, 2004. 陈春明, 孔灵芝, 中华人民共和国卫生部疾病控制司. 中国成人超重和肥胖症预防控制指南[M]. 北京: 人民卫生出版社, 2006. 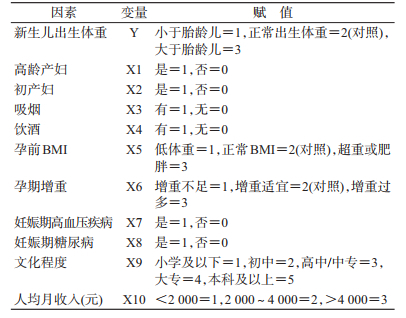 Chen CM, Kong LZ, Burea of Disease Prevention and Control, Ministry of Health of China.The guideline for prevention and control of overweight and obesiy in Chinese adults[M]. Beijing: People's Medical Publishing House, 2006. Institute of Medicine Committee on Understanding Premature Birth and Assuring Healthy Outcomes. The national academies collection: reports funded by national institutes of health[M]//Behrman RE, Butler AS. Preterm birth: causes, consequences and prevention. Washington: National Academies Press, 2007. 邱宏, 余德新, 王晓蓉, 等. Logistic回归模型中交互作用的分析及评价[J]. 中华流行病学杂志, 2008, 29(9): 934–937. 郭玲玲, 申嘉欣, 汝首杭, 等. 孕前体质指数对围孕期增补叶酸与小于胎龄儿关系影响的研究[J]. 中华流行病学杂志, 2017, 38(9): 1263–1268. Rosso P, Salas SP. Mechanisms of fetal growth retardation in the underweight mother[J]. In:Nutrient Regulation during Pregnancy, Lactation, and Infant Growth:Springer, 1994: 1–9.